In the recent elections Fine Gael and Labour insisted on recounting their successes in reversing the economic crisis: tens of thousands of jobs created, property markets and investment on the up, households finally facing into the prospect of tax cuts in Budget 2015: the economy stabilised. Save for the contracting pharma sector – suffering from the externally generated patent cliff – things were getting brighter by the minute. The voters bought none of these claims. Still, the question remains unanswered: has the economic decline been reversed during the years of coalition management? It is a difficult question to tackle. So let us try and brace ourselves for a measure of cold statistics. In very broad terms, the economy can be broken into private consumption, government consumption; private investment, public investment; and net exports (exports less imports) of goods and services. Everything, excluding net exports, taken together is known as the Final Domestic Demand. Adding net exports gets you Gross Domestic Product (GDP). Adding payments on Irish investments abroad net of outflows of payments on foreign investments in Ireland gets you Gross National Product. In an economy severely distorted by the tax arbitrage of multinationals (MNCs) where foreign companies account for the entire trade surplus, Domestic Demand is the measure of economic activity that most accurately measures what takes place in the country. It excludes the pharma and Information and Communications Technology (ICT) exporters who are shovelling massive accounting profits on to our national balancesheet. Domestic Demand rose in the fourth quarter (Q4) of 2013 by €630 million compared to Q4 2012, although for the full year 2013 it was down €366 million, once we adjust for inflation. This means that 2013 was the sixth consecutive year of declines in Domestic Demand, but it also means that towards the year end things started to look a little sunnier. Looking at the composition of our demand, both public and private consumption fell in 2013. These declines were moderated by a rise in investment by €710 million year-on-year. Much of this ‘upside’ was Nama and the IDA attracting foreign investors to Dublin. In other words, it had little to do with our real economy. Residential and commercial real estate valuations did rise throughout 2013 in Dublin, though they trended down in the rest of the country. But in 2014 things have gone off the rails. The national property price index peaked at 70.0 in December 2013 but slipped to 69.1 in March 2014. In Dublin the decline was even more pronounced – from a peak of 68.5 at the end of 2013 to 67.2 in February and March 2014. Building and construction activity picked up in 2013, with the index of activity by value of construction up from 94.3 in Q4 2012 to 105.4 in Q4 2013 and by volume up from 95.7 to 106.2 over the same period. Here’s the kicker, however: much of the construction growth related to completions of already-started projects and retrofits. Planning permissions for new construction, minus those for alterations, conversions and renovations, fell year on year in Q4 2013 and were down over the full year. The pipeline of building commencements into the near future looks dire. Worse still, the contribution of industry, excluding building and construction, to GDP was down €1.1 billion in 2013. Overall, of the five broad sectors of the economy contributing to our GDP, three posted decreases in activity compared to 2012 and two recorded increases. Here’s an interesting comparative. As Chart 1 below clearly shows, since the current Government came to power in Q1 2011, our real GDP in constant-factor-cost terms grew on average by less than 0.76% per annum. During the 1990s recovery this rate of growth was around 14 times faster. Agriculture, Forestry and Fishing; Industry; Distribution, Transport Software and Communication; and Public Administration and Defence – four out of five broad sectors of the economy are down over the three years of this government tenure. Only ‘Other Services (including Rent)’ was up. No prizes for guessing which sector is dominated by internet giants pumping tens of billions of profits earned elsewhere around the world into Ireland to be recycled to tax havens: ‘Other Services (including Rent)’. Personal Expenditure on Consumer Goods and Services has shrunk 3% since the current government came to power, falling at an annual rate of 1%, Net Expenditure by Central and Local Government on Current Goods and Services has fallen at an annual rate of 2.4%, while Gross Domestic Fixed Capital Formation fell at an annual rate of almost 2.3%. So by all metrics, save the one that covers Google and its buddies, the government’s record is hardly impressive. Which leads us to another question: what is there to look forward to in the economy between now and the next general election? There are some positive signs on the lead-grey economic horizon. The Purchasing Managers’ Indices for Manufacturing and Services are growing. Investment remains sluggish, with credit in the economy continuing to shrink and cost of loans continuing to rise gradually. But non-traditional sources of funding are showing signs of growth: investment funds, private equity and even some direct peer-to-peer lending. As banks shift defaulting mortgages into ‘restructured’ portfolios of loans, the numbers of new mortgages approvals, although volatile, are on a gentle upward slope. However, the average value of mortgages approved continues to trend down. Retail sales are faring much worse: the value of retail sales in Q1 2014 remained the same as in Q4 2013 and is up only 0.6% over the year. Their volume is up 0.2% and 2.6%. Which means that deflation is still cutting into retail earnings and new hiring is still off the agenda of Irish retailers. 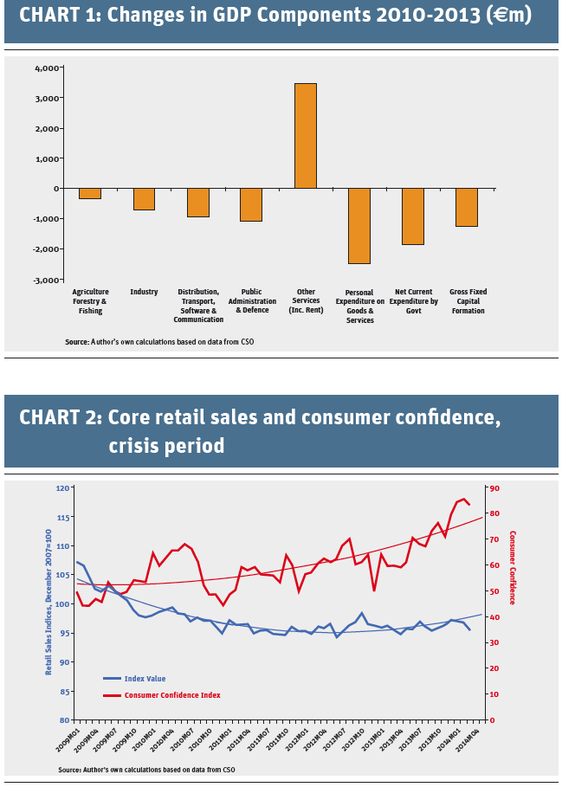 However, encouragingly, retail sales have finally started to move in line with consumer confidence in recent months, although gains in retail sales still severely lag behind confidence, as the chart below shows. Meanwhile external demand for Irish goods and services maybe improving at last, although you couldn’t tell this from the hard data, for now. The growth in global demand has yet to translate into indigenous exports growth for a number of reasons. Chiefly, growth in global trade volumes has shifted toward trade between middle-income and emerging economies – and away from advanced economies. This pattern prejudices Ireland. MNCs based here predominantly trade with the US and Europe. The rest of the world is supplied from other countries. Irish exporters are finding it tough gaining a foothold in emerging markets. In the 12 years since 2002, Irish exports to markets outside the EU and North America stagnated as a share of our total exports at a miserably low 15-17%, as the chart below illustrates. Growing our indigenous exports will require serious rebalancing of our sales and marketing efforts toward the markets outside our familiar spheres. The good news is that we have a ready base for such a push. Our competitive advantages are in the sectors where the presence of MNCs has resulted in Irish indigenous startups gaining experience, intellectual property and access to early stage supply contracts, e.g. auxiliary services in international finance, ICT and biotech. Most Irish exporters resell foreign goods and services without adding any serious value to them. In order to push these firms into exporting, they need to identify potential ways for adding value to imported goods and services and then identify the markets where this added value can generate sales. They must also increase productivity. While, during the crisis, the Irish economy regained some share of the competitiveness lost between 2001 and 2008, these gains were achieved predominantly through 1) on-shoring of large-scale ICT services providers (Google, Amazon, etc), and 2) massive jobs-destruction in less-productive sectors, such as construction, retail and other domestic services. Stripping out the MNCs with their tax arbitrage, the Irish economy is more competitive today than it was between 2004 and 2006 only because we are no longer employing builders and not adding more convenience shops to every street corner of every town. It won’t help indigenous exports. The final drag on the prospects for exports-led growth is skills. The requisite skills are not offered by the vast pool of the unemployed. Despite the claims of 70,000 new jobs created by the Government, data from the CSO shows that in Q1 2014, there were only 49,500 fewer unemployed in Ireland than in Q1 2010, of which 14,314 came from higher numbers in state training programmes, such as JobBridge. While the Government has been successful in reducing unemployment, progress has been weak. The Irish economy has been creating new jobs that require excellent commands of foreign languages, coding and other technical skills that cannot be easily taught to those of older age. A coherent, long-term and comprehensive strategy is needed to deal with all the underestimated problems adumbrated above. The Coalition might deserve credit for doing hard things over the last three years, but it still an open question whether it deserves the credit for doing the right things. Preparations for smugness should be suspended. Previous article Charities Regulator: make role broad.